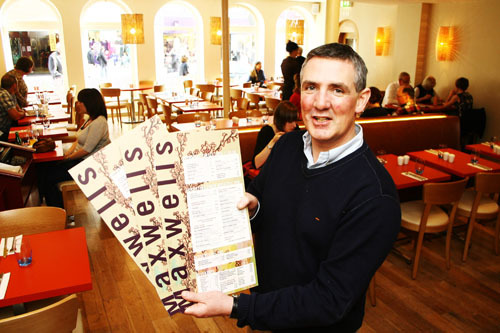 Maxwell’s Restaurant on the corner of Eglinton Street and Williamsgate Street is back in business. Having lain idle for close on three years Galway’s oldest restaurant reopened for business during the summer. Maxwell’s forms part of the old Colonial Buildings which were built by Austin Semple in 1866. In its early days it was a whiskey and wine Import business as well as a high class grocery run by an F McNamara and Co. In 1900 it was bought by an Austin Green who married a Miss Maxwell from Longford and Maxwell McNamara & Co came into being. The company was known far and wide for fine wines, whiskey and tobacco and the business bottled and sold its own brands some which are still on the property today. In more recent years it was known as the Cellar Grill and later Maxwell McNamara’s in memory of its original owners. The baton has now been passed to Paul and Maureen O’Meara to continue the tradition of serving and selling fine food and beverage at these premises. Neither is new to the business of catering. Paul is a former manager of the Connemara Coast Hotel. Maureen who comes from Cong, Co Mayo as well as having a career in the hotel industry spent many of her childhood and teenage years working in her mother’s well known ‘ Quiet Man Coffee Shop ‘ in Cong. Maxwell’s has had a serious makeover with the help of local interior design company Tripod. The old windows, now exposed in all their grandeur, leave in lots of natural daylight and allow the diners inside do some innocent people-watching up and down Williamsgate Street. The menu reflects and caters for the diverse group of customers who work, shop, and visit this part of Galway city. The doors open at 10am for morning coffee and late breakfasts. Lunch starts at 12.00 and rolls on until 5pm.The emphasis is very much on serving delicious food at affordable prices. Lunchtime light bites include pan fried Irish wild mushrooms and sweet potato and watercress Soup. There is a delicious selection of homemade sandwiches and salads. Fish is in great demand with the current lunch time favourite being pan fried mackerel with pea risotto and cucumber riatta. Other lunchtime favourites include butter chicken with egg fried rice and noodles’and sausages with black pudding and thyme with champ and apple gravy. Those who prefer vegetarian dishes will enjoy goats cheese Wellington’ and ‘pumpkin and lentil Pie’. The desserts which some just enjoy on their own in the middle of the afternoon are all the old favourites such as homemade apple cake, rhubarb crumble and chocolate brownie with cherries and cream. The dinner menu runs from 5pm until 9 and later at weekends and is designed to offer Galway a new alternative for dining out. The newly launched autumn and winter menu promises lots with entrees such as ‘pork belly with pumpkin puree and lamb and lentil pie. The good news is that everything is great value with lunch entrees around €10 and most evening dishes around €15 or less. There is also a value menu for €25 for three courses and €20 for two including a glass of wine.